NIGERIA is endowed with significant solid mineral resources that have the potentials to attract investors and investments to boost economic growth in the country. The mineral resources range from tin, copper, bauxite and gold to mention a few. Unfortunately, this endowment is being undermined by constant illegal mining by some persons including foreigners, believed to be sponsored by moneybags. An investigation by our correspondents showed that Osun and Ekiti states are majorly affected by these menace. This has resulted to environmental hazards to the affected communities. Overtime, residents of the affected communities have expressed their concerns and displeasure towards the activities of the illegal miners with their efforts yielding minimal results. Speaking with our correspondents, the traditional ruler of the affected communities, the Ajero of Ijero Ekiti , HRM Oba Adebayo Adewole, Arojojoye 11, disclosed to Nigerian NewsDirect that both genuine miners and illegal miners have occupied the mining site as their activities exposed the community to environmental hazard. According to him, effort of the community to checkmate the operations of the miners over the years has proved abortive as he called for the aid of the government in protection and harnessing the resources deposited in the site for economic growth. “There are illegal miners in the site just like every other mining site where there are always illegal miners, but the case of the town is different as there are more illegal miners than the real miners. “It provides a lot of employment for the people. There’s nothing we can do to the control of the miners, if are driven from there by day they will return by night and vice versa, its only government that can help us in controlling them, we as a community we are powerless in controlling them. “This really contributes a lot of danger to the community. Like the one that is very close to the town on top a hill, below the hill are a lot of danger, because it’s not done in the legal way it posits an environmental degradation, a lot of danger in this because there is no proper and professional handling of their operations. “ We are really in need of government help to control this; we don’t have the power or the capability to control their activities. 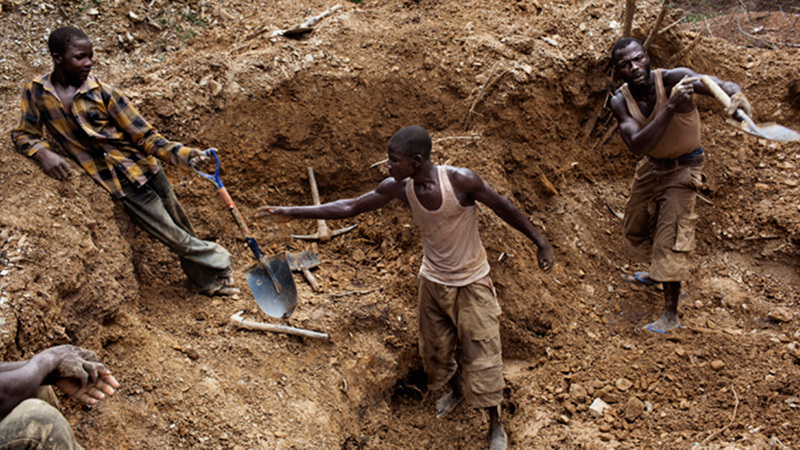 A resident in Ile Ife, one of the affected towns in Osun State, Elufowora Eluyemi said although illegal mining was a normal occurrence in the town, it became worse about two years ago. According to him, although the mining was on a small scale before but it has since been taken over by “Hausa miners who dig the land while trying to extract gemstones but give paltry sum to land owners and pocket the rest. “The issue became worse about two years ago. What they do is that they come to the land owners and make a deal to pay 10 per cent of whatever is extracted to them. “It is sad that despite the health hazard posed, this practice has continued. We therefore urge government at all levels to put a stop to this and compensate those affected,” he added. Also the President, Nigerian Mining and Geosciences Society (NMGS), and a Professor of Applied Geology and Professor S.S Dada, in his reaction believes private companies should cooperate with the government to ensure the proper monitoring and reduction of illegal mining in the country. In his words, “There is a program in place to monitor illegal mining. People are dying of lead poisoning because of the chemicals and methods been used for recovery of the minerals whether gold or lead. They use a lot of toxic materials such as cyanide which they may not know how to handle. “But the companies must cooperate with the government. My stake is that if government is not doing systematic mining and they are making money and passing the benefits to the people and the people are able to associate themselves, mine and make profits. “If government sets something up and people are paying the right royalties, it will flow back to the people in form of good roads among others,” he said.